Afternoon folks. Going to try and keep this one short as I’m sure you’ve all been watching the news. 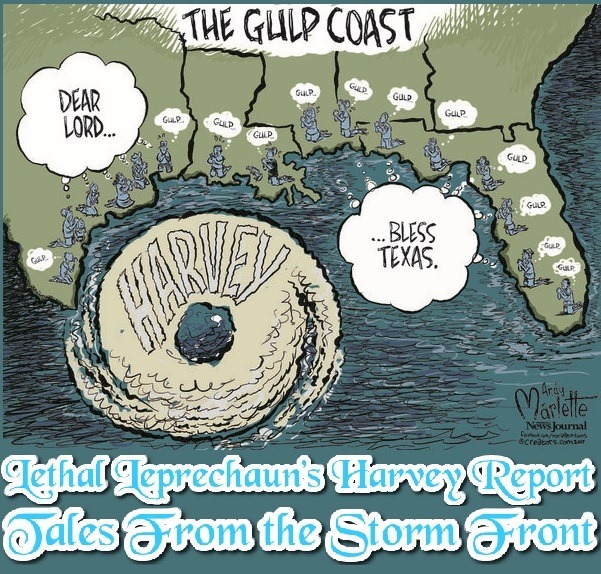 I know that the national news as one person Molly talked with said “Has all of Texas Gulf Coast dying from Harvey”. While there have been only 3 fatalities that I am aware of so far. I think as usual they are sensationalizing, over hyping the situation for ratings sake. While there are of a certainty places that are flooded and very bad not all of Houston is that way…yet anyway. We were just told we could expect up to another 15 to 20” of rain by Friday before all this is over. In the last 24 hours as of this posting we have received an additional 15.4” of rain. If you add that to what we’ve already received that’s about 19 to 20” total to date and its currently still raining. Most of the heavy stuff occurs at night largely due to atmospherics and the sun’s heating the air. Once it starts cooling off what has gone up into the air from the Gulf must come back down. Overnight we had numerous Flash Flood Warnings and extensions plus several Tornado Warning. Fortunately none of the Tornado Warnings were near us but when you’re barely sleeping as it is and the NWS alerts go off on your phone 2 and 3 times an hour it makes an already long night even longer. We are still dry, safe & secure. So far, we’ve lost no services of any kind. Honestly there has been surprisingly little loss of power associated with Harvey for a storm of its type, magnitude and size. We’ve had a couple heavy bands and T-storms push through today, from 10 AM – 12 PM we got 2.68” of rain alone. I have in the last couple hours begun to notice a change, minor ponding in a couple places. As the ground becomes heavily saturated it cannot drain the heavy rain fast enough so we have some small low laying areas that have formed small puddles. If we continue to get enough breaks and lulls these shouldn’t be an issue. The Houston area 911 system has been overwhelmed. We are being advised to shelter in place even if we have water in our home (we don’t as of now). Our evacuation options have been cut down to one route (the one we’d be taking anyway). Even that we’ll have to keep an eye on as Cypress Creek which crosses I-45, our evacuation route is 5.5’ above flood stage and forecasted to go higher yet. Molly will be working from home at least tomorrow for sure as most of her coworkers who live near where she works are reporting a lot of flooding and in one case even 1 small tornado touching down near them. I understand that the street leading to her place as well as it’s parking lot frequently flood but apparently the building does not. All in all we continue to be very lucky with Harvey. Thank You all for your thoughts prayers and well wishes. I will try to continue the 1 a day updates when/if/as I am able as we are still experiencing some quite understandable Internet issues intermittently. On a side note in closing: I can report that we, or at least I for sure, am getting notices once again when you post comments for approval. LOL, of course now I can’t see them in our blog control panel unless I go there via each individual email. Continue to keep you and your family in my prayers. My relatives in Lufkin as of now are okay…not as much rain there. The best place to be when one of these events occurs is well away from it. LOL. Thanks, Ginny that means a lot. Thanks too for mentioning the Ninja Kitties as I should have mentioned them in my update. Neither are happy with Harvey at all. They are deprived of windows because the rain pelting them frightens them as does the wind when it slams into them. Additionally, the rain/ fogged up windows make it hard to see out of period for them. Cats instinctively know when bad weather is approaching and this is apparently wreaking havoc with that sense of theirs. Chai has taken mostly to hiding (in some new and difficult to locate places) and sleeping while SC pretty much wants to be held and comforted all the time. I saw with Molly, on whom SC was laying just dozing, for about 3 hours watching the coverage and trying to read earlier. When she attempted to make SC get down SC crossed the small table between our loungers on to me. When I would make her get down, she’d go right back to Molly. Usually if she is with me or on my chair its across the top of the chair on a blanket we keep there for the purpose. I tried putting her up there because I felt bad for Molly who was trying to do something on her lap top. From SC’s reaction you’d have thought I was torturing her. I now have very clear nail patterns in my chesy from all of SC’s toes from her desperately hanging to me. When a Thunderstorm hits it’s even worse. ALl night about 5 to 10 minutes before one would hit SC would begin pacing the hallway and crying until Molly got her to lay with her. Between Molly’s dealing with SC and me being awoken by the NWS warning I don’t think either of us got very much sleep last night at all. them and they may think thats whats about to happen. Stay safe brother. Prayers for you and all the rest who are either down there with you or have family down there. Howard (and all the rest of you, as well) I know I speak for Lethal when I say we really do deeply appreciate your Fiendship or…um…Friendship. I meant friendship. My brother lives in Pearland, so I am keeping a close eye on the storm results. Pearland has gotten it much worse than we have. I sincerely hope he’s safe and has no flooding issues with his home.